Bean sprouts were eaten about 350 to 400 years ago in the North-eastern area and the Kyushu area. They started to be eaten through out all of Japan starting from the Taisho era. 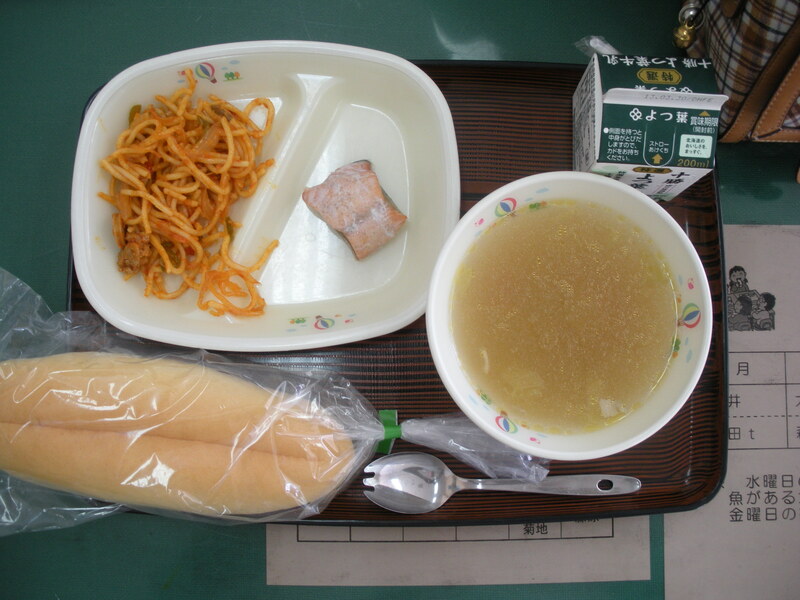 When I was a student, my favourite school lunch was a sort of ramen like dish called Saimen. However, sometime during intermediate school, they stopped serving it and replaced it with a yakisoba like dish made with saimen noodles and a lot of bean sprouts. I dearly loved proper saimen, so this was quite a betrayal to me. For that reason, I still harbor a grudge against bean sprouts in my heart. But actually they are quite tasty. New-style Omelet is a normally round shaped omelet cut in half to make the shape of a fan. It is fried up with potatoes, bacon, and cheese. Today’s dessert, flan, is made without eggs. So those with egg allergies can safely eat it. It tastes even more delicious when everyone can eat it together. The above paragraph is slightly depressing to me, as I can’t eat flan, due to the milk. However, it doesn’t matter much to me because everyone brought bento lunches today. As pictured above, I included “vanilla ice cream” flavoured soymilk in my lunch, which is even better than flan in my humble opinion. Milk products like flan, pudding, and ice cream leave a nasty stickness in the mouth after you eat them, but soya never does. So even if foods like ice cream didn’t make me want to die of pain for the next wo hours, I would still prefer soy. 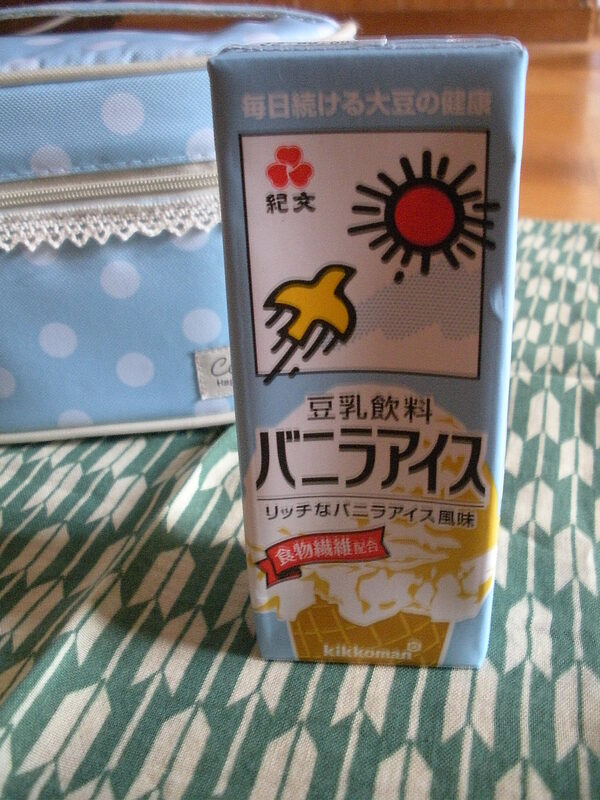 In my tropical homeland, I bought soymilk by the half-gallon, 2 cartons every week. It came in four flavours I beleive: plain, vanilla, chocolate, and very vanilla. Here in Japan it comes in 1000 ml cartons, of which I buy 4. So I am still drinking a gallon of soymilk every week. It cames in four flavours too: plain, processed, coffee, and milk tea. The last is my favourite, but I am trying to be less decadent, so I usually drink the processed variety. Also, the latter uses Japanese soybeans, which I prefer over the Canadian soybeans the company who makes the milk tea flavour uses. Finally, since I know you all are dying to know what a charming foreigner like myself eats, here is what was in my bento: Along with my soymilk was steam rice, takuan pickles, half a boiled egg, burdock kinpira, corn’n’tuna, teriyaki meatballs, and yokan for dessert. Today starts boushu (lit. grain-in-ear), which is one of the 24 seasonal divisions when arista grains such as wheat and rice are planted. During this time, the farmers are very busy with planting seeds and other tasks. At the school I went to today, there was no school lunch, so everybody brought their own bento. 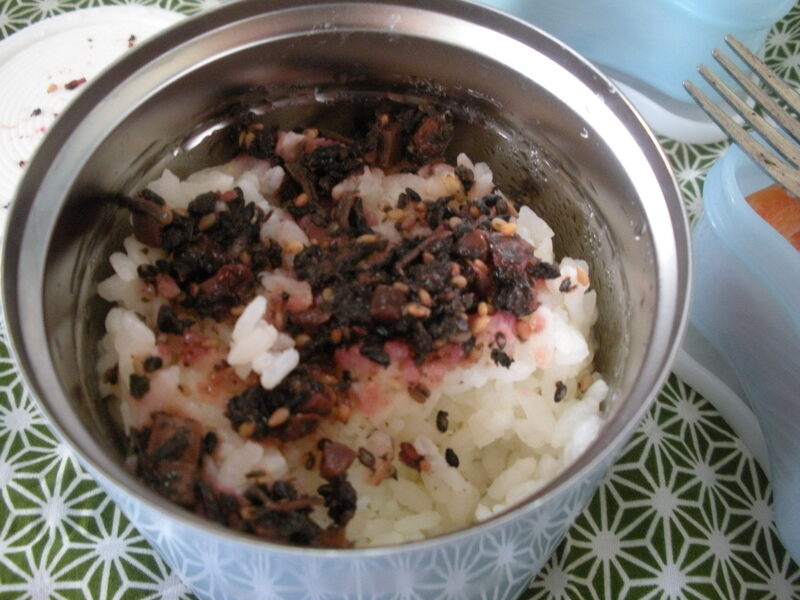 I forgot until the last minute, so I ended up with the only food in my house: umeboshi rice, carrots, and banana chips. Not true– I also had some takuan, but it wasn’t cut up yet, so I didn’t bring it today. One student related how nice it would be to bring bento everyday. Another student, who had to actually make her own bento today, disagreed. Think of the poor mothers who would have to make the bento everyday! In the teacher’s room, I overheard another comment: A bento made yourself never tastes that good. So people have many different opinions on the matter. The 24 seasonal divisions are solar based periods matching the agricultural cycle. China, and thus Japan, previously used a largely lunar-based calendar, which lacked accuracy as far as agriculture went. So these seasonal divisions were created to better guide the farmers in their work. Setsubun, the well known holiday often translated as “The Coming of Spring”, is technically the day before four of these seasonal divisions: Shunbun (Spring’s start), Geshi (Summer’s start), Shuubunn (Autumn’s start), or Touji (Winter’s start). The roots of yakisoba lie in the Chinese “Chow Mein”. Chow mein is a general term for fried Chinese noodles and it’s said there are over a hundred varieties. 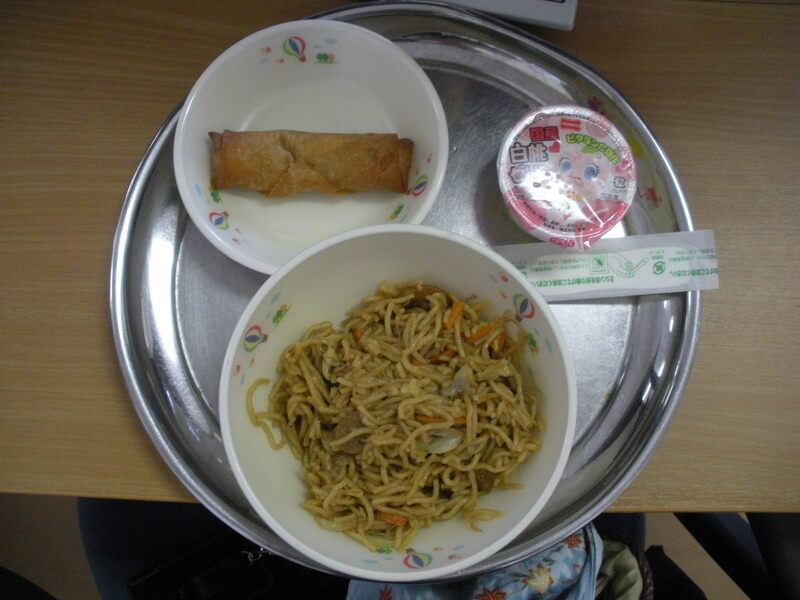 Today’s yakisoba was popular among the students, but I have to say it was, as usual, too greasy for me. In relation, I would like to share a quote from the Cambridge World History of Food. I think this is still true for many Japanese people. 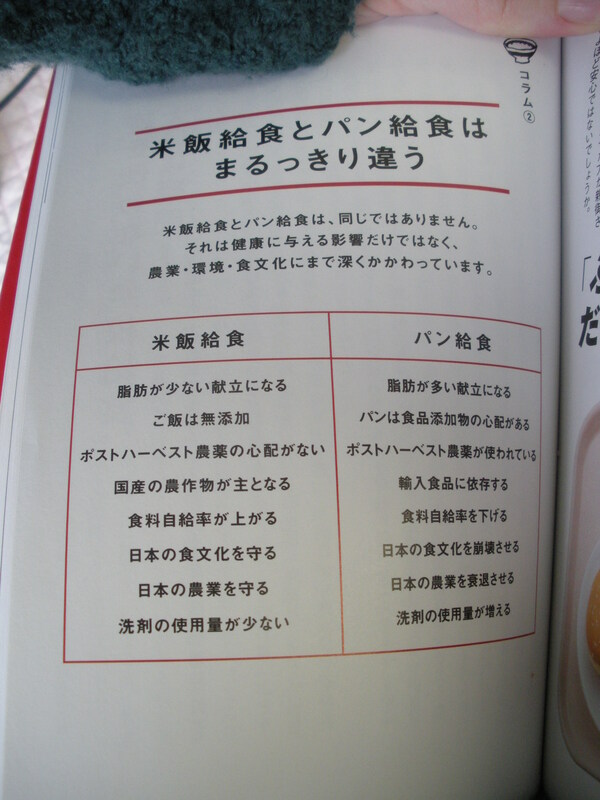 However, school lunch was first instituted on the Western model with the ambition of building up the physical stature of the Japanese people, and this influence is still seen in the milk, meat, and oil focused menu. When children were under-fed at home, a high calorie school lunch was very important. Now, with Japan’s first world affluence though, it seems unnecessary. Of course, children tend to like things high in fat and dislike vegetables, so that probably contributes too. As an aside, the danger of buckwheat allergies in children makes the real soba that I desire to eat in school lunch remain but a dream.